A major shopping thoroughfare bordering Fitzrovia to the east and Bloomsbury to the west. It is also the name of a Tube station. It follows a north-south axis, continuing the line of Charing Cross Road, from Tottenham Court Road Station past Goodge Street Station to Warren Street Station (and not far from Euston Square Station). 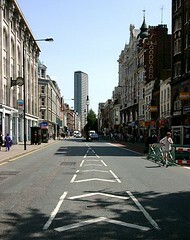 It is dominated by electronics and computers shops to the south, with more furniture retailers up towards Euston Road. Last edited 2009-01-12 14:14:14 (version 8; diff). List all versions. Page last edited 2009-01-12 14:14:14 (version 8).